Author William Fieldhouse utilized pseudonyms like Chuck Bainbridge and John Lansing for the action series' 'Hard Corps' and 'Black Eagles'. As Gar Wilson, he penned over 30 'Phoenix Force' novels. Fieldhouse contributed to the Mack universe with six 'The Executioner' titles and a handful of 'Stony Man' entries. 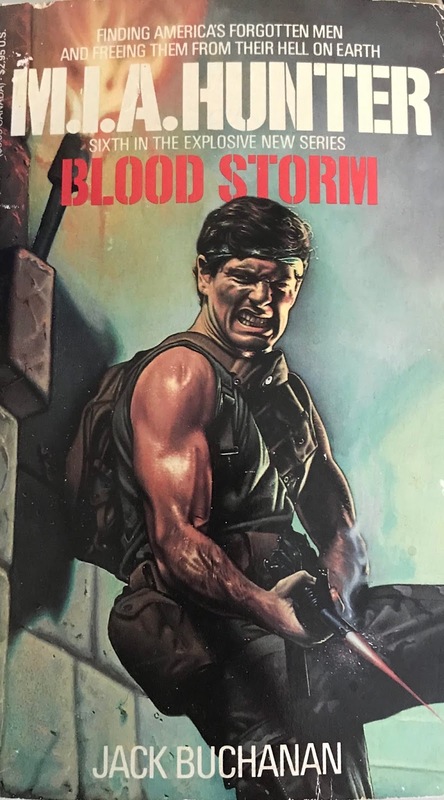 In 1986, Fieldhouse stepped in as house name Jack Buchanan to draft “Blood Storm”, the sixth volume of Stephen Mertz's 'M.I.A. Hunter' series. 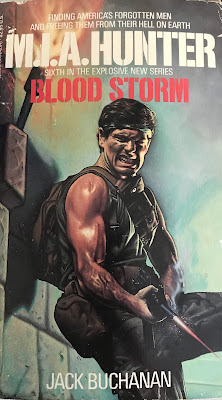 While many of these books focus on Mark Stone's trek into Laos, Columbia or Vietnam to rescue P.O.W.s, “Blood Storm” really expands on that idea with a more dynamic presentation. Under Fieldhouse's vision, the narrative branches out to incorporate drug smugglers, a C.I.A. kill team, a team traitor and the obligatory prisoner rescue. Mertz's editing keeps the book cemented in series mythology, but the story is a different one this time. Due to Hog Wiley's injury in “Exodus from Hell”, Stone and Loughlin are forced to recruit a new third member for their rescue mission into Laos. A mercenary by the name of Gorman requests a meeting at a dive bar called Golden Butterfly in Thailand. Loughlin hates Gorman right off the bat, but the three come to a monetary arrangement and the mission is set. Before they can exit the bar, hardmen burst in and a raging gun fight fills up Chapter Three. Loughlin suspects Gorman is behind it, allowing the author to utilize the mystery to propel the storyline. After the typical weapon purchases at An Khom's house (where Stone often retrieves his intel and firepower), Stone heads off to sever a C.I.A. operation that he thinks was behind the Golden Butterfly assault. After a heated exchange with old nemesis Coleman, Stone heads to the rescue party with Loughlin and Gorman. There's a bit of a plot spoiler here with Gorman's background, but I'm going to save it for you to discover on your own. Soon, the rescue attempt is in full-swing in Laos. There's exciting gunplay with Laotian leader Captain Luang, including some brutal scenes of torture involving simple thorns and branches (those Inquisition guys had it all wrong). Up until this book we've seen Stone in some precarious situations but those pale in comparison to the happenings here. Mixed into the break-out are opium dealers who want to capture Stone alive to sell to the highest bidder – the C.I.A., K.G.B. or Vietnam. This all culminates into a pretty hefty storm as the book finalizes with a surprise visit from series mainstay Hog. The bottom line, “Blood Storm” is yet another entertaining installment of this beloved series. Mertz's series continues to gain new readers and the books have been reprinted for mass consumption in our digital age. Grab it for a buck.